We’ve written elsewhere about the Balance Sheet and why it’s so important, so here we thought we’d provide an example of how a completed one might look. What follows below is pretty cool; it’s a sample sheet taken from a Coca Cola annual report with all lines to the value of $0 lines removed. It deviates from a format in which they are often presented, which is to have assets on the left side and liabilities & equity on the right hand side, and actually looks quite similar to the format in which KashFlow produces them. We found this balance sheet example here and decided to include it because it’s always helpful to see a real document when you’re learning about the theory behind them. You’ll notice that, in both of the above columns, Total Stockholder Equity + Total Liabilities = Total Assets, i.e. Coke’s Balance Sheet balances! The example above is also included here because it has some nice big numbers for you to aim for with your own business…! Because the above example uses two columns to outline different years, rather than assets and liabilities & equity as is sometimes the case in a Balance Sheet, the sum of the numbers in the left hand column does not equal the sum of those in the right hand column. If you think of the above balance sheet example as two set alongside each other, you’ll realise that this is to be expected; the document can be used to derive a business’s net worth, and you would not expect that value to stay the same from one to year to the next, especially for a huge multi-national company like Coca Cola. We’ve written a bit more about how a Balance Sheet is generated in KashFlow (you can also follow that link to see a sheet produced by KashFlow), but you’ll be glad to know that there’s really very little to it! 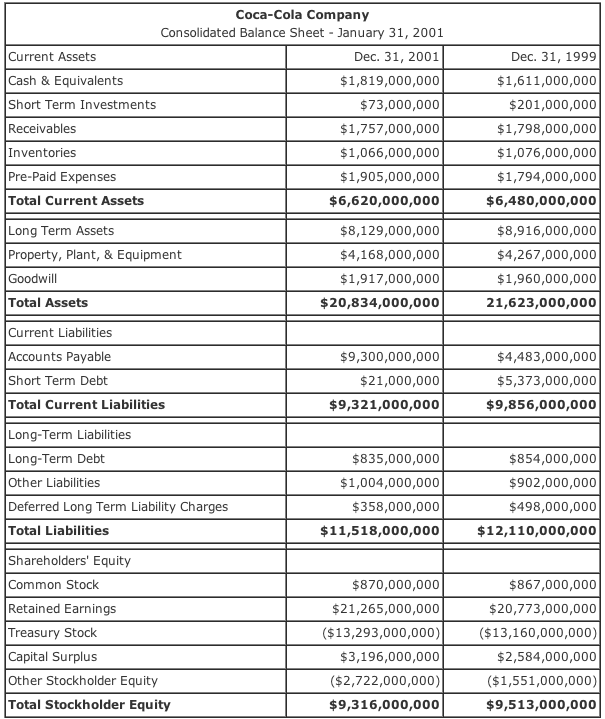 It’s worth noting again here that the Balance Sheet example produced by KashFlow is all in one column, but it should still always be the case that the sum of total assets is equal to the sum of total liabilities and equity.